ATLANTA – To tackle a key client pain point—a need for more accurate and consistent vehicle information—Manheim is rolling out a new InSight Condition Report that enables buyers to make faster, more profitable decisions. With enhancements fueled by clients’ need for more accuracy and consistency, the new report features more manufacturer data, crisper photos and improved visuals, which makes it easier and faster for clients to view important information and make smarter and more confident decisions. The new InSight Condition Report is part of the $10+ million investment Manheim has made in its condition report technology, and is driven by the new Inspections application co-developed with industry partner AiM at Manheim auctions and mobile sites. The new InSight Condition Report brings clients several enhancements that improve upon its predecessor, which was rated best-in-class by clients in a blind assurance study during the design and testing process. Manufacturer data, including packages and options, is added automatically during the capture process, leading to increased accuracy and consistency in the report’s creation. The new visual display enables clients to digitally “walk the vehicle” on any digital channel in the Manheim Marketplace. This display provides quick, at a glance information about the condition of the vehicle—fueling faster decision making for buyers. 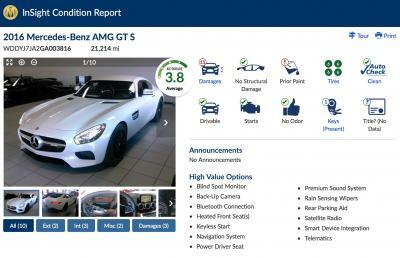 Crisper photos with pan-and-zoom functionalities, including a heat map to quickly view damages, improves buyers’ confidence in getting the vehicle expected. And finally, Manheim will have access to data from prior Condition Reports, providing a consistent representation of each vehicle as it moves through the Marketplace. Digital buyers tend to look at listings with condition reports first, making these vehicles popular. Manheim research shows that dealer units with condition reports were 2.5 times likely to sell online via Simulcast than units without a condition report. Additionally, dealers enjoy peace of mind knowing that vehicles with condition reports have a decrease in arbitration over units without one. Sellers get a good return on their investment when they purchase a condition report, as the reports more than pay for themselves when considering an average $40 per day vehicle holding and depreciation costs. That adds up to $1,200 in 30 days, making selling vehicles faster a priority.